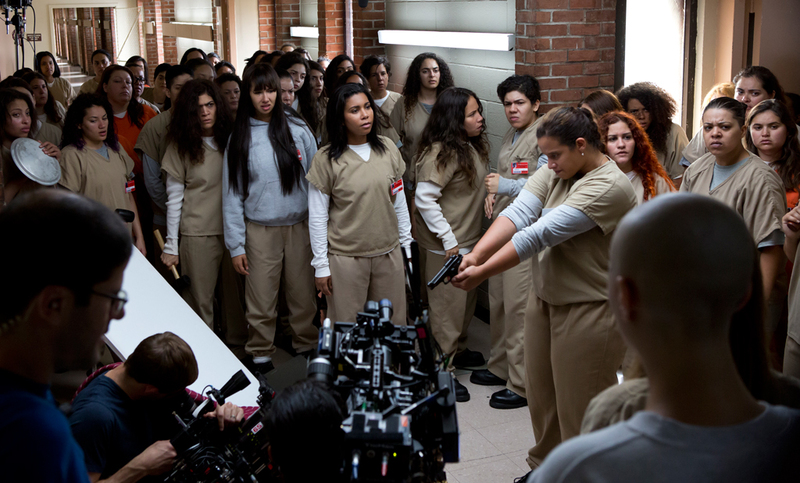 Last season ended with a very strong cliffhanger: Daya holding a gun to the head of a guard. And we have been holding our breath since: will she pull the trigger? But, that wasn’t the only question left fro answers: will Poussey have her deserved recognition? 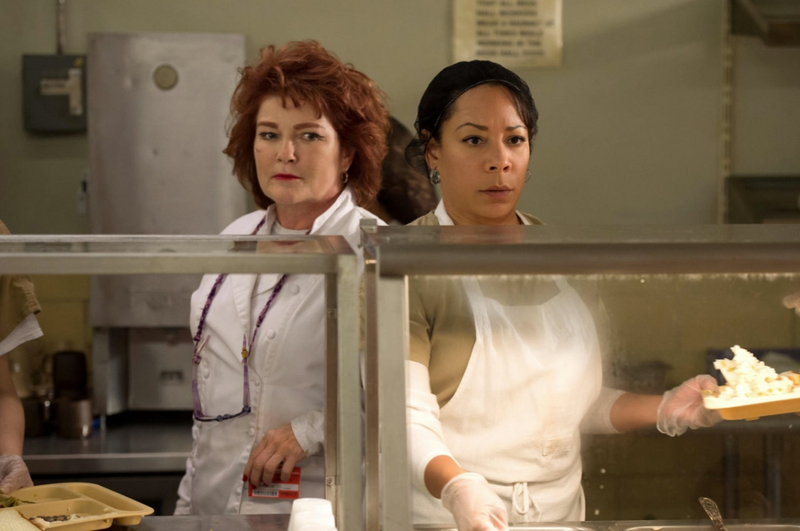 Will the inmates take over Litchfield? Will they have justice? Justice or unjustice hasn’t been a big theme in the previous seasons, because we basically knew that the prisoners had received a right sentence until the writers decided to put a spotlight on the private exploitation of the prison (in the States and not only) and the status quo that enthralled us got completely overturned in season four. 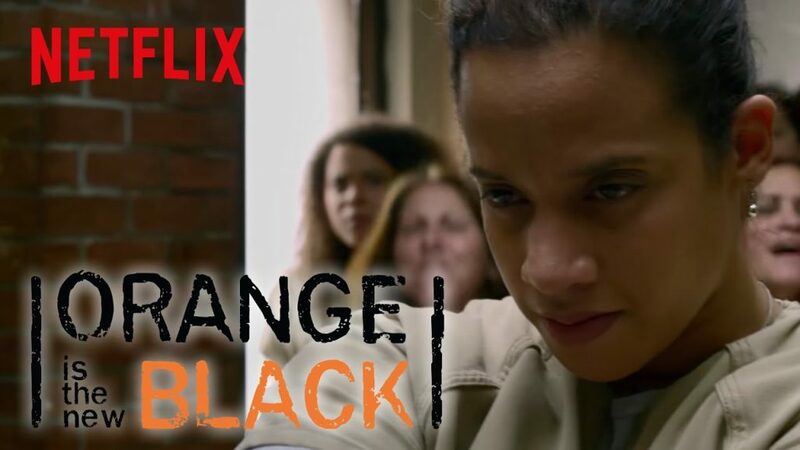 I believe that it was a much needed plot to explore in this Netflix dramedy that already dealt with “un-pop” themes like female homosexuality as much as hired a wonderful transgender actress for the role of a transgender inmate (first time in US TV) giving the possibility to this series to exit the niche and to be elevated it to the international visibility that it deserves. 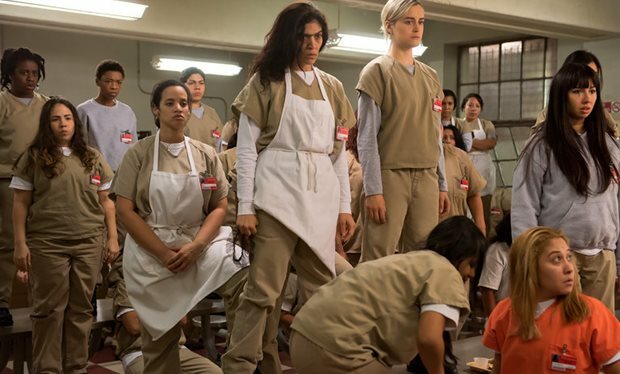 The protagonist Piper and the other charismatic inmates built for us such a complex world, full of facets that talk about real life and don’t lean on the usual stereotypes. 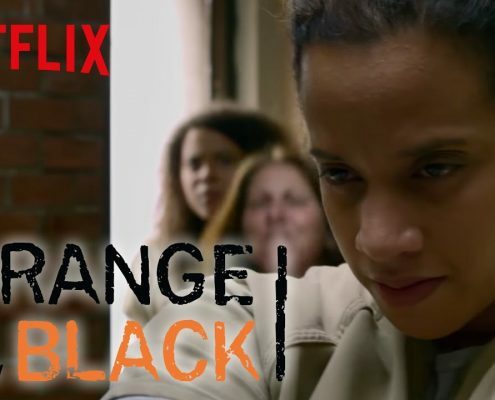 That is why the truth of their experiences and relationships, mixed with the absolute talent of the leading actresses among which stands Uzo Aduba, awarded for the role of Crazy Eyes, keeps us locked in front of the TV for a few days every time a new season gets released. This year won’t make a difference. I’m sure I’ll finish the 13 episodes in the next two days! Personally I also appreciate the passion for cooking of some of the most loved characters and all the culinary themes infused in the story. Therefore I copied a recipe invented by Red in an episode of the third season and I hope you’ll use it to “feed’ yourselves during those 10 plus hours of watching awaiting you and perhaps also in the next months when you’ll be craving for the sixth season of Orange is the New Black which has been already commissioned such as the seventh. For the pie crust: 2 cups of flour, 12 spoons of butter, 10 spoons of iced water, salt. 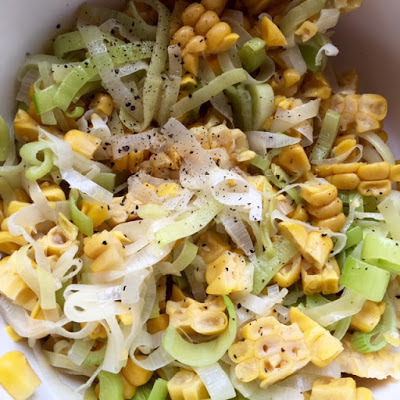 For the filling: 1 corn cob, 2 leeks (directly from Litchfield’s vegetable garden), 4 spoons of heavy cream, 4 eggs, 2 ounces of grated cheddar cheese, butter, salt and pepper. Sage leaves, seed oil. Writer’s Note: I’ll proceed with the preparation just like Red would do, but you can also use a packaged pie crust and skip to the filling part of the recipe. To be sure to prepare a perfect dough cut the butter into cubes and put it in the freezer for thirty minutes with flour, water and the mixer’s blade. Just like for Twin Peaks cherry pie crust pie flour, salt and butter have to mixed together and then add four spoons of iced water. 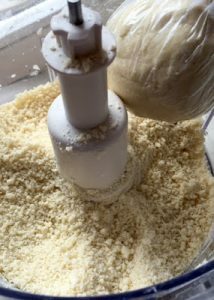 The consistency will always have to look like flour with cold and hard pieces of butter even when more water is added till when you pinch some of the dough will stick together. 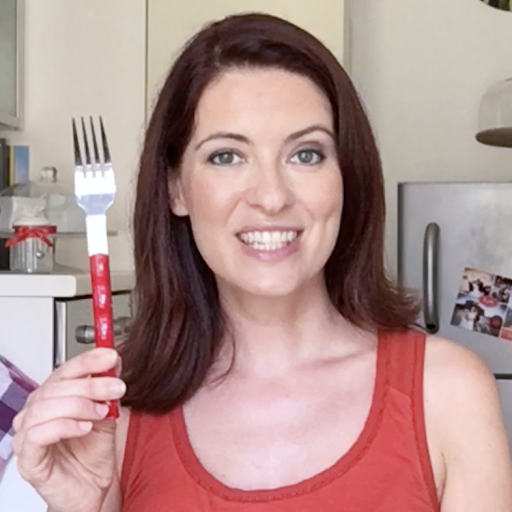 It depends on the flour and butter that you’ll use, but it should take 10 spoons overall. It’s very important to try not to touch the flour with hands too much, because the hands’ warmth will melt the butter! Spoon the dough in a bag and work it till it becomes a ball (see the pic). Put in the fridge for at least an hour. Slice the leak and sauté it in butter till it softens, then cut the corn out of the cob after you cooked it. Mix everything together. Beat the eggs with the heavy cream and the grated cheddar cheese then add also the vegetables and season with salt and pepper. Before rolling the crust let it rest out of the fridge for twenty minutes. Roll the pie crust and put it in a buttered pie shell, pour the filling. Bake it at 400 F for 30-35 minutes. 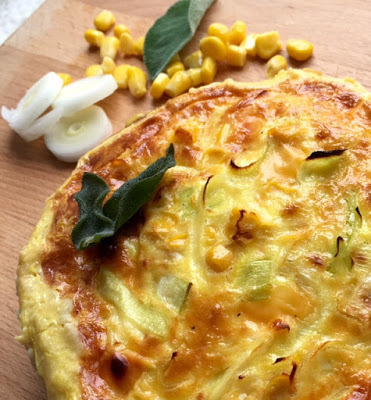 When the quiche is cooling, fry the sage leaves using hot seed oil. Feel FREE to change the vegetables based on the ones you find!